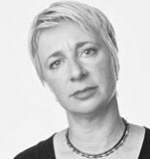 INTRODUCING OUR LATEST RESIDENT TEACHER – CHRISTINE BASIL. 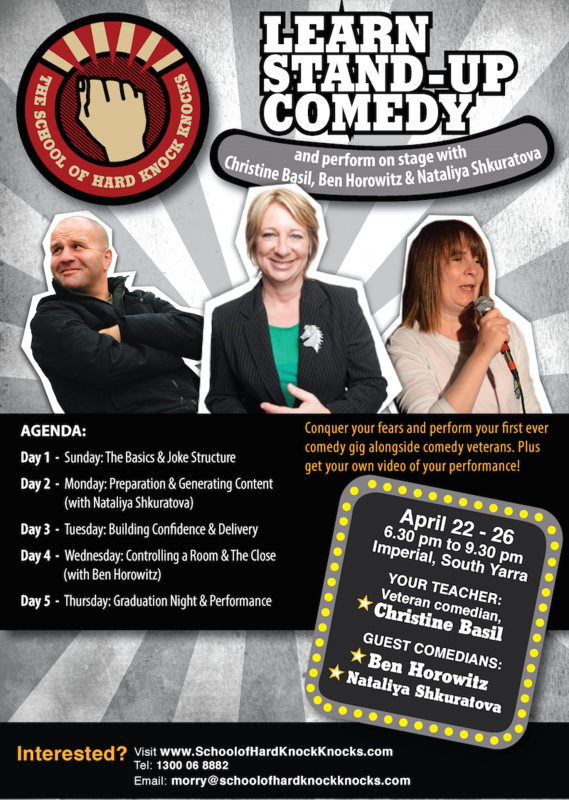 Christine Basil has an incredible resume of writing and performing comedy and is your teacher over the five day course from Sunday 22 to Thursday 26 of April, from 6.30 pm to 9.30 pm, 2018. 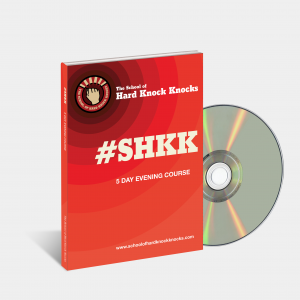 You’ll get the SHKK comedy manual, video of your graduating performance, and lots of coaching from veteran of the comedy circuit, Christine Basil, as well as School of Hard Knock Knocks co-founder, Ben Horowitz, and alumna, Nataliya Shkuratova. 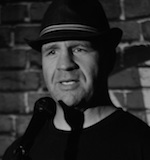 Introduction to the basics of stand-up comedy and the jargon of the comedic industry before launching into joke structure and developing your very own set. Learn to understand your audience, recognise taboo topics and create your own original and funny material. The moment you have been working toward! Perform your stand-up comedy routine in front of family and friends, conquer your fears and perform alongside Christine Basil, Ben Horowitz and Nataliya Shkuratova, to a paying audience. Receive your own personal HD video of your performance too! Some might say that Christine Basil was a late starter in the stand-up comedy scene. But she didn’t let her marriage, kids and dogs get in the way. 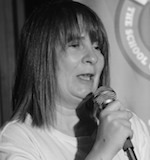 Kicking off in 1991, Christine has since taken her comedy around the world, and seen her write and perform TV comedy shows including Full Frontal, Totally Full Frontal, and Skithouse, to name a few. She also had a successful stint on commercial radio. With that experience, it’s no wonder she’s a popular comedy coach for up and coming comedians on the Australian comedy festival circuit. Ben Horowitz has played every possible room imaginable, and some that are not. Over the past 15 years, Ben has performed to audiences as large as 3000, and as small as three. He’s performed at comedy clubs, RSL clubs, and music festivals, alongside comic greats, like Greg Fleet, Chris Franklin, Brad Oakes, Steve Hughes, Dave O’Neil and Jeff Green. He’s headlined and MCed, killing it on stage and also bombing. And that’s what makes Ben an ideal comedy teacher – he’s experienced the best and worst the comedy circuit has to offer. Nataliya is one of the hardest working alumni that has graduated from the School of Hard Knock Knocks. You’ll see her at almost every open mic venue, when she’s not getting paid gigs across Melbourne. Born in the Ukraine, with a wicked sense of humour, Nataliya brings her own personal story to her comedy, but isn’t shy to exaggerate to the point of hilarity.